Using a scented candle is a great way to make your place feel a little homier, and to freshen up the atmosphere. The problem with burning store-bought candles, though, is that some contain a slew of chemicals you’d really rather not be breathing in. If you’re looking for an eco-friendly alternative, this simple recipe brought to you by Hubpages may be just the thing you’ve been looking for. Before you get started, you need a citrus fruit, some cooking oil, and a book of matches. Once you’ve got that, and a clean place to work, you can make yourself a citrus candle with just a few minutes of work. You start by cutting your fruit in half through the middle. Circular fruits work best, but if your fruit is uneven you can always put it in a candleholder to keep it steady. After you’ve cut the fruit, carefully work your thumb in to separate the rind from the inside of the fruit. 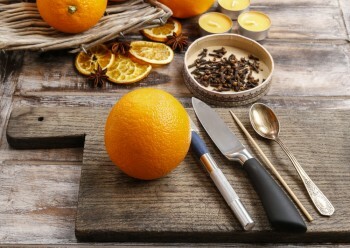 You want to make sure you leave the center stem intact, so that what you have is a bowl made from your orange or grapefruit skin with a natural wick sticking out of the base (the stem). The next step is to fill the fruit bowl about 3/4 of the way full with cooking oil. You should make sure the stem is thoroughly drenched with oil as well, using a spoon to ladle some over it if necessary. Once that’s done, strike a match, and light the natural wick. That’s it! For more green life hacks that can brighten up your home, simply contact us today!